The Bilisoft* Phototherapy system has been developed to provide a solution for Jaundice Management. The Bilisoft system meets or exceeds the 2004 AAP Guidelines for intensive phototherapy and helps you provide developmental and family-centered care virtually anywhere—in the NICU, pediatrics units, well baby nurseries, and at home. It can be used in many environments. BiliSoft* can be used in a radiant warmer, an incubator, a crib, or in a caregiver’s arms. It supports developmental and family-centered care. You and your patient’s family can wrap, feed, and hold baby during phototherapy sessions, which promotes a healing environment without interrupting the benefits of kangaroo care. Both options help ensure quick access to the baby. The LED light engines last for thousands of hours. The units host a long-lasting blue LED light engine that provides 8,000 to 10,000 hours of light therapy. 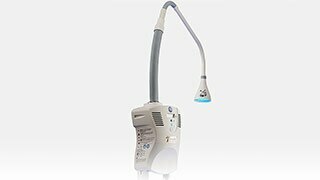 The BiliSoft* Phototherapy System features the technology to provide intensive, efficient phototherapy as recommended by AAP Guidelines. Its increased surface area, high spectral irradiance, and long-lasting blue, narrow-band LED light are just the beginning. Provides a large surface area. The pad design also helps to eliminate distance deficiencies entirely. BiliSoft promotes developmental care and enables infant-parent bonding while providing healing therapy where it is needed. The baby can be held, fed, or swaddled while receiving treatment. Ultra-soft, disposable BiliSoft covers are made of skin-friendly fabric and are available in flat covers or nests.